When my dad arrived in Paris for his first visit to see me, the first communication to me was a phone call that said, "I'm trapped in my hotel room and I've already called the police...twice" Oh boy. I was nervous to see where the week would go from there. We started with my Parisian welcome ritual of lunch at L'As du Fallafel. I like to think it's a cure all for jet lag, or at least a big enough falafel pita sandwich to put a smile on a weary travelers face. Over our three days in Paris, we saw a lot of the big Paris notables - the Louvre, the Eiffel Tower, Montmartre, Sacre Coeur, and Notre Dame. We explored Paris by foot, boat, metro, bus and taxi, though by the end, we used the latter a bit more than the rest. I can already hear my dad saying that I tried to kill him, making him walk 750 miles over the week - uphill, both ways. We took a walking tour of the 2 islands with one of my favorite groups, Paris Walks, and because my dad was so good during the whole tour, I bought him Paris' famed Berthillon ice cream as a treat. He loves sorbet so we sampled some new flavors including pear, which will be going into my summer rotation. We braved the crowds at the Loure to see sculptures, the best in home decor, and the tops of many people's heads looking at the tiny Mona Lisa. Of course there was a lot of food eaten along the way. We toured the Bastille farmer's market and sampled the freshest orange juice, mixed with banana. We had seafood bigger than my dad. He got to meet a few of my friends in Paris at a graduation dinner for Stephanie, whose mom was also visiting. 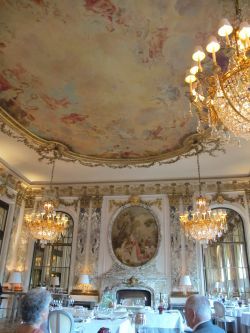 And given his new love of high end food, which I try not to take credit for due to an also newly forming gastro snobbery, we tried out the 3 star Michelin, Paris institution, Le Meurice. 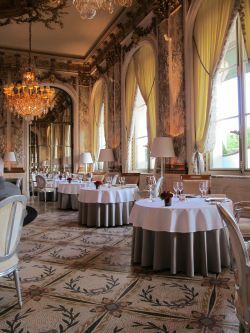 Since we didn't have time to get to Versailles during our trip, I figured eating in this dining room would be the next best thing. Everything about the experience was done with military perfection. There were about 5 servers to each table, and it became my dad and my mission to make them crack, kind of like you want to do when you watch the Royal British guards. Suffice it to say, that by the end of the meal (and yes 4 hours and many, many wine pairings after) I had the sommelier flexing for me and asking to feel his arm. We also had tray holder #1 (our personal favorite) giggling by dessert, but of course he still never dropped a thing. The menu ran the gamut from crab cooked in a special porcelain dish brought to our table to asparagus, poached foie gras in red wine (not our favorite), fish dumplings (sleeper hit), veal and many, many desserts. The room, the food, the service - it was all perfection. That said, it was also lacking a little soul, or maybe my preference now is a little more warmth. It's certainly not a meal you would eat every day, nor could you afford to (unless my dad comes back to town :). I will say that the chef Yannick Alléno did spend some time in the dining room with each table, which was a very nice touch. He probably wanted to thank us for helping to send his kid to school. He was very warm and personable, and I'm looking forward to trying his new, more casual bistro next week, Terroir Parisien. He even gave us news of a third place in the works. I guess adding that wine pairing helped! It was a lovely Parisian experience and great start to my dad's trip in France. Next up - Provence!